Did you know that a soldier at one Army installation can agree to "swap" assignments with a soldier at another installation, as long as it doesn't cost the government any money? It's true, and it's part of a little-known and little-used program for exchanging assignments, unofficially known as the "SWAPS" Program. Every month (or so) the Army Times publishes a list of soldiers who wish to locate others of the same rank, MOS, and basic qualifications, stationed at installation(s) they desire to be assigned at. Soldiers can use this listing to contact these soldiers desiring to SWAP, and make an informal agreement. One of the soldiers then initiates the SWAP request, using DA Form 4187 (Personnel Action). In order to qualify for an assignment exchange or SWAP, soldiers must meet the following criteria. Both soldiers must agree to the SWAP, must be of the same rank, same MOS (job), and be similarly qualified. Exchanges must be CONUS (Continental United States) to CONUS or OCONUS (Overseas) within their same OCONUS command. The commanders of both soldiers concerned must concur in the proposed exchange assignment, and agree on the date of assignment. Soldiers must serve at least 12 months at current duty station and have at least 12 months time remaining in service upon arrival at the gaining installation. 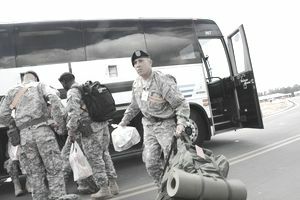 Soldiers will pay all costs incurred in relocation, and all travel time will be charged as ordinary leave. Eligibility for foreign service does not change, and no stabilization period is authorized for either soldier. Soldiers in receipt of AIs, or in a deployed status, are not eligible. If a married Army couple currently occupying a common household is separated because one soldier is granted an exchange assignment, the other soldier may not apply for reassignment to the same installation to reestablish a joint residence.